I've done pretty well in avoiding the WrestleMania repaint waves exclusive to Toys-R-Us, but I made an exception for this Undertaker figure. At this year's WrestleMania event, the Undertaker increased his unprecedented winning streak to 20-0 setting a record that will more than likely never be broken in the WWE. A testament not only to the phenomenal abilities of the Deadman, but his popularity as a professional wrestling persona for over twenty years. Today we're looking at his latest WWE Elite figure by Mattel, based on his appearance at WrestleMania 28. Watching the event back in April, I immediately thought "well, there goes Undertaker's next figure!" when he emerged on the stage wearing a creepy hooded robe covered in spikes. 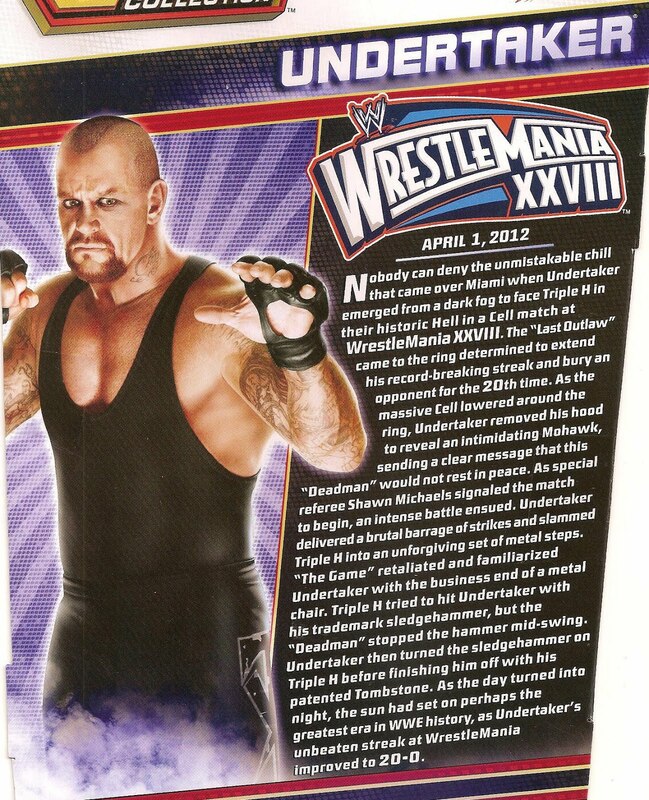 I thought it was a sure bet Mattel would deliver that version of Taker. They did in a way, but something is clearly missing. Mattel didn't include the entrance robe Undertaker used at WM28 with this figure. He does receive a couple of accessories, but nothing specifically related to the Undertaker. More on that in a minute. To create this figure the design team really only needed to sculpt a new head to capture the faux-hawk Undertaker was sporting during the event. The likeness is really good here and looks almost identical to his Defining Moments figure from last year. Of course, he trades in his long stringy hair for a Chuck Lidell-style buzzed mohawk which is actually sculpted on the head and not just dependent upon paint to create it. Below the neck he is the same figure we received in Elite series 1, 8, 14 and WM series 26 & 27. Sculpted tank top on torso, tights on legs, MMA gloves and removable left elbow pad. This figure does get some new thigh designs on his tights, Taker's old-school "T" logos, which look nice, but can be hard to see if you don't look at him under enough light. You know with these tights, the gloves from his "Ministry of Darkness" figure, the series 1 or 8 head and a new tunic, Mattel can give us a mid-90s Undertaker. You know, this outfit. I smell a future FLASHBACK figure! So Mattel decided to skip the entrance gear and give Undertaker some weapons, which he did use during the Hell in a Cell match against Triple H.
The sledgehammer is reused from Triple H's first Elite figure way back in series 2 (sorry, no link. I'm kind of shocked I haven't reviewd that one, yet!) and ironically was used ON Triple H during the battle. Not much to say about it. It looks like a sledgehammer, so it's accurate. The second accessory is a folding chair and I'm honestly surprised it's taken this long to get one in the Elite series. They've been used in the Basic & Two-Pack series almost from the beginning, but haven't made it into the "collector" line. It's a constructed of three separate pieces and is fully assembled out of the package. It works like a real steel chair so you can keep it folded and have Undertaker bash other figures with it (except on the head, that's a "no-no" in the WWE nowadays) or push down on the seat to open the chair and allow him to take a seat. The entire chair is molded in black plastic and has a slightly textured finish just like the figures. The WWE logo is sculpted on the back rest and was kind of difficult to photograph, but I think you can make it out alright. Interestingly Mattel created a special one-off package for this figure just like the ones for the newer Ringside Collectible-exclusives featuring Superstar-specific graphics on the boxes and background inserts. Undertaker's box focuses heavily on the "20-0" record and uses the entire length of the backside to provide a summary of the match. I think if Mattel had included the entrance coat this figure would have been pushed over into the "must-have" column for collectors and Undertaker fans. As is, he's not a bad figure, but TRU is asking $19.99 for him and basically the only new thing in the box is his head. At this point you probably already have at least one Elite Undertaker figure, if not more, so you may be better served by spending the cash on a Superstar you don't already have. If you need the hammer & chair, his value increases, but otherwise he's not something you should feel bad about missing out on. I'm not a big fan of his mohawk look, but the figure turned out fine. You can enter for a chance to win a "WM28" Undertaker figure in the Hive's Christmas contest! Full details will be revealed tomorrow morning so be sure to sign up for the 3BTH Newsletter! The Honeypot: HTF Hot Wheels, TFs, Joes & WWE!